This article is about the film. For the song by Clyde McKnight, see Simon Sez (song). For the song by Chayanne, see Tiempo de Vals. Interpol agent Simon goes on a mission in France to save a kidnapped girl and defeat an arms dealer. Dane Cook as Nick Miranda. John Pinette as Micro, a fellow cyber-monk. Ricky Harris as Macro, a fellow cyber-monk. Filip Nikolic as Michael Gabrielli. Natalia Cigliuti as Claire Fence. In 1998, Variety announced that Ringo Lam would direct Simon Sez with Kevin Elders. Lam later only contributed to the film as a producer. The film was released in 1999, opening in Los Angeles on September 24 and then in New York on September 25. The film grossed a total of $292,152 on a $10 million budget, making the film a box office bomb . On Rotten Tomatoes, Simon Sez received a 0% rating based on 19 reviews with an average score of 1.8 out of 10. The New York Times wrote a scathing review, saying that "its plot seems as if it had been fished out of the wastebaskets of writers who have written scores of better examples of the genre dating at least as far back as Dr. No in 1962," but praising Rodman as "inescapably watchable." Entertainment Weekly gave the film a D- rating referring to the film as "a shoddy mess" and "a bargain-basement rip-off of Ronin and that Rodman was "yesterday’s threatening omni-sexual exhibitionist turned today’s overexposed cliché." ^ a b c d e f g h i "Simon Sez". American Film Institute. Retrieved September 4, 2014. ^ "Burton eyes 'Hollow'; Rodman wrestles". Variety. June 18, 1998. Retrieved July 9, 2014. ^ Leydon, Joe (27 September 1999). "Review: 'Simon Sez'". Variety. Retrieved 28 February 2014. ^ "Simon Sez (1999)". Box Office Mojo. IMDb. Retrieved September 4, 2014. ^ "Simon Sez (1999)". Rotten Tomatoes. Retrieved 2010-05-29. ^ Gelder, Lawrence van (September 25, 1999). 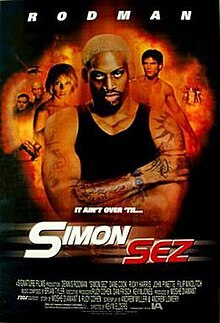 Simon Sez (1999) Film Review; Dennis Rodman, a Terror for Terrorists. The New York Times Film Reviews 1999-2000. Retrieved September 4, 2014. ^ Gleiberman, Owen (October 1, 1999). "Simon Sez". Entertainment Weekly. Retrieved September 3, 2016. This page was last edited on 13 March 2019, at 19:27 (UTC).